Drawing of a field mouse with his banquet. As two farmers till their field, this gray mouse appears to be enjoying the fruits of their labor. 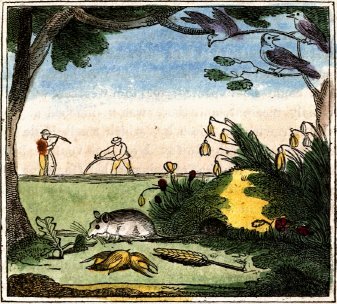 It’s a sweet little drawing that is in the public domain and includes some flowers, a tree, birds, grasses and grains. Catharine Parr Traill and her publisher A.K. Newman and Co. did not identify who they used to illustrate Little Downy but it was published almost 200 years ago in 1822 and is in the public domain.